Last week when West Virginia's Pat White broke the all-time NCAA QB rushing record against Louisville, I had mixed emotions. One part of me was so happy for Pat and his WVU teammates while the other part of me was sad that an era was coming to an end. With college football down to two more games for most teams (some only one), I would only get to see #5 in the old gold and blue twice more... man, that stinks! When I started this site about a year ago, it was an easy choice on who's mold I wanted the logo of "SpreadOffense.com" made from, I figured that the most inspiring spread offense player(s) over the previous 3 seasons was Pat White (and his partner in crime at the time, Steve Slaton). Hence, I made them the second and third WVU players that a logo was molded after (the first being Jerry West, who's the mold for the NBA logo). This upcoming Saturday (December 6th at 8:00pm, televised on ESPN2), West Virginia plays the University of South Florida at West Virginia for Pat White's final home game as a Mountaineer. 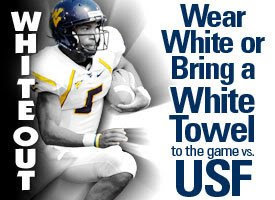 WVU is officially making it a Pat "White Out" event, meaning everyone in the stadium is being instructed to wear 'White' clothing in honor of #5. The WVU Official Sports website recently released their 'Top 10' Pat White all-time game performances as a Mountaineer, go to: http://www.msnsportsnet.com/page.cfm?DB_OEM_ID=19400&story=13796 to see them. The Mountaineer's will make a bowl game this year so that will be Pat's last official game, but do yourself a favor and tune in Saturday night for his last home game. If you love the modern day spread offense... You'll love seeing the 'Magician' one more time in front of the home crowd. Thank you Pat White... I can't wait to see you in the NFL.